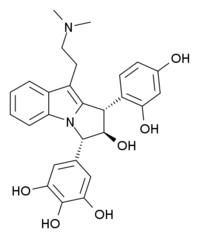 Yuremamine is a phytoindole alkaloid which was isolated and identified from the bark of Mimosa tenuiflora in 2005. As a pure compound, yuremamine is a purple amorphous solid. It represents an entirely new family of indole derivatives. ↑ Vepsäläinen, J. J.; Auriola, S.; Tukiainen, M.; Ropponen, N. & Callaway, J. (2005). "Isolation and characterization of Yuremamine, a new phytoindole". Planta Medica. 71 (11): 1049–1053. doi:10.1055/s-2005-873131. PMID 16320208.